The Small White is a common European butterfly. This species is also called The Small Cabbage White. It’s latin name is Pieris rapae and it’s a small white butterfly with black dots at the tips of the wings. This butterfly species is especially cool because it is so easy to raise. It’s a great pet for children. Also in schools it is a great teaching tool to learn more about nature. The Small White is found all over the world: across Europe, North Africa, Asia, and Great Britain. Right now it also occurs in North America, Australia and New Zealand even though originally it’s not from there. People accidentally introduced this species to those places. 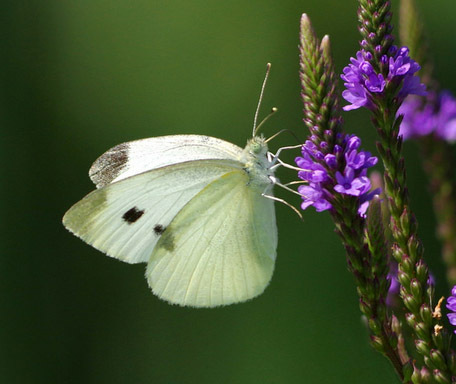 The small cabbage white butterfly is white with black wing tips. The wings also have a small black dot. This species also looks a lot like the Great White or Great Cabbage White butterfly (Pieris brassicae), but as the name suggests, this species is smaller. The caterpillars of Pieris rapae are light green with very short fluffy hairs all over its body. The bigger species, Pieris brassicae, has caterpillars that have black spots all over their body. The Cabbage White butterfly eats cabbage when its still in its caterpillar stage. As an adult butterfly it eats nectar from flowers. In captivity you can feed it sugar water. You can feed the caterpillars with leaves of cabbage, this can be green cabbage, red cabbage, Brussels sprouts, Bok Choy or kale. The best is organic vegetables, because regular cabbage could contain too much pesticides for the caterpillars. Adult buttterflies drink nectar or sugar water with their long tongue. If you do not release the butterflies, you should feed them with sugar water. Mix 1 part sugar or honey with 7 parts water and stir until all sugar is disolved. Put the sugar water in a plastic cup and cover it with a thin mesh, for example a mosquito net. The water level should reach to around 1 cm under the mesh. Place this cup inside the butterfly environment. The butterflies will sit on the mesh and stick their tongue into the sugar water. They can drink without them falling into the sugar water. Replace the water every day as it will spoil. The caterpillars of this species are very docile and don’t move much. If they are on their food plant, cabbage, they will only move to reach the next bite. If they do not have any food, they will walk around actively abeid slowly trying to find a new leaf. The Small White butterflies are very active. They fly around during the day and rest during the night. Especially in warm environments these butterflies really like to fly and could end up destroying their wings if you place them in a too small container. The Cabbage White is a very easy butterfly species to keep. The caterpillars, pupa and butterflies need to be kept at temperatures around 20 °C. In the night the temperature could drop to 15 °C without problems. The day temperatures could be as high as 35 °C. So there is a wide range of temperatures that are OK for keeping this species. For humidity it also does not have a lot of requirements, just not too humid. Mold grows at high humidity and mold close to the pupa or caterpillars is deadly. If you notice mold you should keep the humidity down, by not adding water or by increasing the temperature in the enclosure a bit. You can house the caterpillars of this species very easily. They need a plastic or glass container with a good lid. In the box or the lid there should be plenty of air holes for proper ventilation and oxygen. Place some paper on the bottom of the container for easy cleaning. Just lay the fresh cabbage on top of this. Gently brush the caterpillars on top of their food, or place a piece of their old food with the caterpillar on it on top of the new food. The caterpillars will walk to their food without problem. Provide the caterpillars with fresh cabbage every day. You can keep the Cabbage White pupa in a similar container. Keep the pupa on a damp piece of kitchen paper, the paper should never be wet but just a bit moist. Make sure the container has plenty of ventilation. Keep it at the proper temperature, as described below. You can keep the Cabbage White butterflies in a huge cage. A cage with mesh sides is best, this gives a lot of ventilation and prevents the butterfly from flying into the sides of the cage. A glass cage or terrarium also works, but the butterfly will damage its wings as it flies into the glass. The best is to release the butterflies into nature as soon as they emerge from their pupa. This is only possible if the Small Cabbage White occurs naturally in your country and area. You can do a lot of damage to nature by releasing new invasive species like the Cabbage White. In some countries its illegal to release non-native insects. Please check the law for your country before releasing these butterflies into the wild. 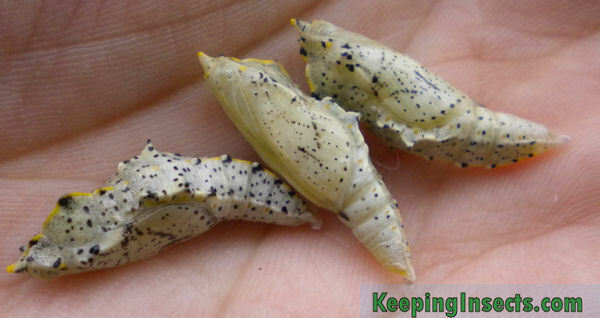 The pupae of Cabbage White. You cannot easily hang them on a thread because it can harm the pupae. Just keep them on a piece of paper inside a container. It’s easy to breed Small Cabbage White butterflies. If you have raised the caterpillars succesfully and the pupa eclosed into adult butterflies you can start to breed with them. Just keep male and female butterflies together in a big enclosure. Make sure they have plenty of food, a temperature above 20 °C (best is 25 °C) and a big enclosure. The butterflies will mate by themselves. Place a cabbage leaf in the enclosure, on this leaf the female will deposit her eggs. The eggs are small and yellow. How to distinquish male and female Small White butterflies? That is easy. The females are bigger than the males. The females also have a lot more black markings on their wings. The females have larger black tips at the end of the wings and two larger black spots on the middle of their wings. The males have only one small black dot and a small marking on the tip of the wing.